I know I have a bad habit of doing things last minute. Given that a day has only 24 hours with my life surrounding three kids, my hands are always always full. If I can get a day to just sew, it makes me the happiest woman on that day. The reason for this quick tutorial is because I just finished one stocking under an hour yesterday and it made me mighty proud of myself. So I wish to share this moment of satisfaction with you so you can be as happy as me. 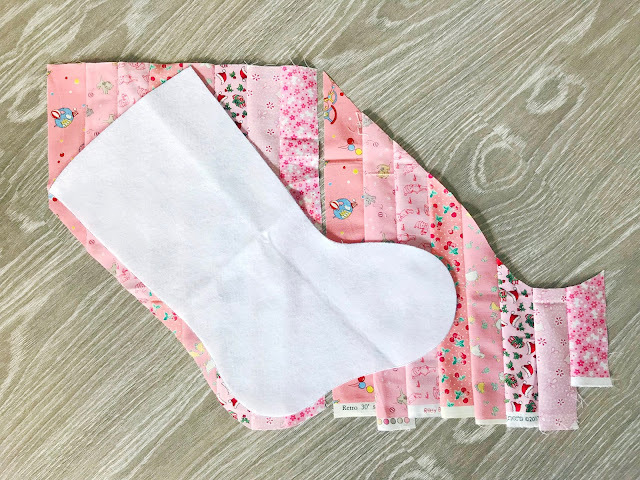 Actually there is a half completed stocking waiting for me ever patiently every night for hand sewing. It's a really beautiful Bucilla Christmas stocking with a cute snowman. And I have another two more Bucilla stockings (one fairy and one Santa) for my other two kids. In mid November, I eagerly took out the packages and thought to myself "One stocking per week. Easy peasy!" Well, I was so wrong. Way too ambitious seriously! Obviously I did not complete anything and I have to think of an easy way out so the kids can stop asking "do we have Christmas stockings for Santa this year?" I tried to buy one but it costs at least USD10 for a decent one. I am stubborn enough not to give in. This Christmas stocking is jelly roll friendly (saves cutting time!) and minimal fabric wastage. If you are still waiting around or hesitating to make one, try this. 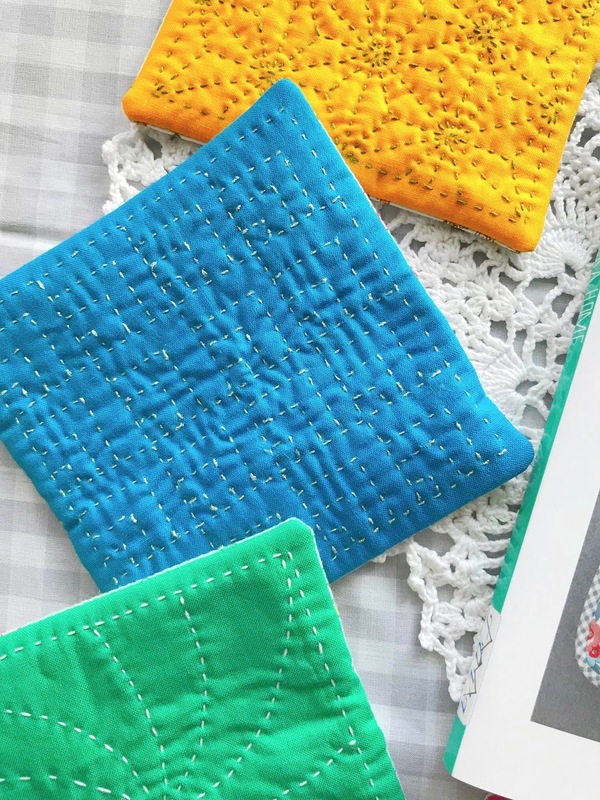 It's easy and very fast to sew. And it makes your kids happy I am very sure. 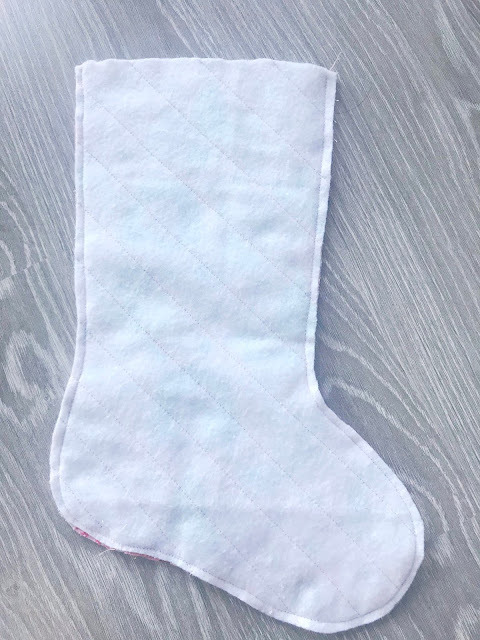 Trust me, this stocking really took one hour for me to make. That includes choosing and cutting of fabric. If you are beginner, maybe it will take you two? Step 1: Sew all the strips together. Print and cut template and place diagonally on the patchwork. Cut out the part near the heel leaving a 1" edging. Step 2: Position the cut out patchwork to the toe area and sew the strips together. Step 3: Reposition the template on the patchwork facing up. Place backing fabric right side down and fold batting into half. Cut around the template leaving 1" edging. Step 4: Machine or handquilt both front and back of stocking separately on batting. If you are using fusible batting, remember to iron to fuse batting to wrong side of fabric. Step 5: Fold the lining fabric into half. Place template again on the quilted pieces (front patchwork right side up, backing right side down) and lining fabric. You should have five layers (including template). Pin in place. Use a sharp scissors and cut all at once following the template shape. Step 6: With front patchwork and backing right sides together, sew 1/4" all around excluding the top of stocking. Repeat with lining fabric but leave a 5" gap for turning out later. Step 7: Turn the stocking inside out. It's time to sew on the ribbon. 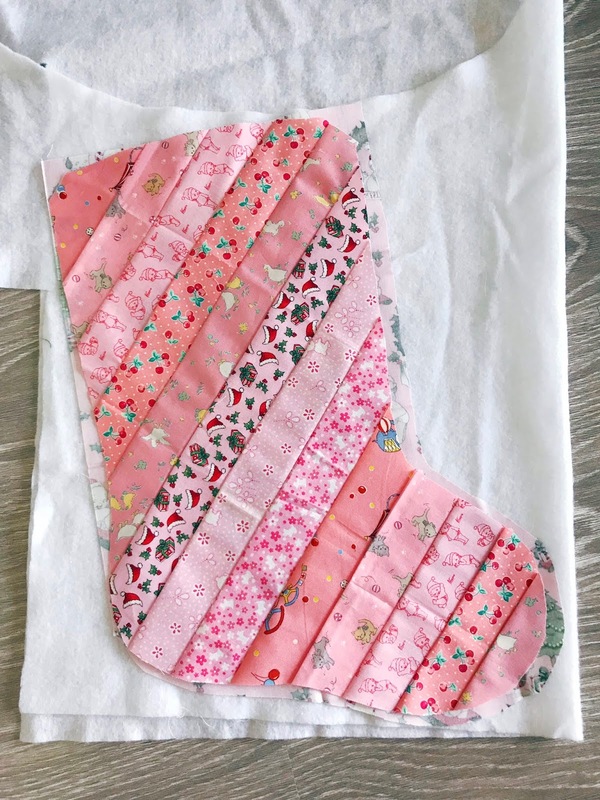 Fold ribbon into half and sew 1/8" at the side of the stocking. Step 8: Place the stocking into the lining and sew around the top of stocking. Step 9: Using the gap in the lining, pull the stocking out and adjust accordingly. Step 10: Sew to close the gap in the lining. Step 11: Push the lining fabric inside the stocking and top stitch around the top of stocking. This is a super quick tutorial for a "Super Zippy Pouch". My kids are laughing at the cheesy name but I loved it! 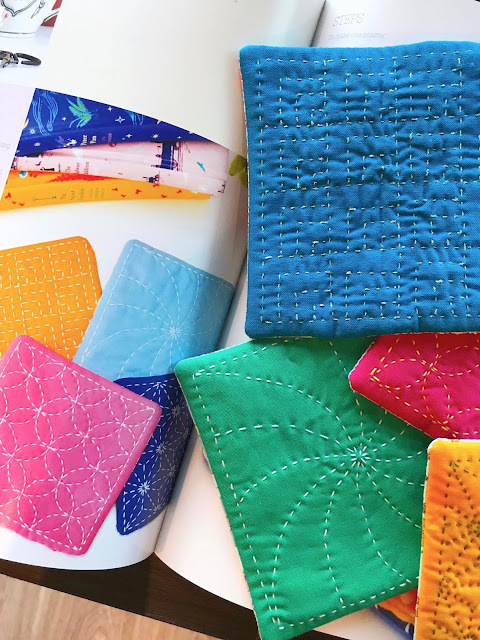 The point is, you can add as many zippers as you want to make this pouch. There is no limit! I got this idea from a smiggle pouch that my daughter has. It has zippers all around. I don't have enough so I made the other side with quilted fabrics. It still looks fantastic and funny. The inside of the pouch is basic with bias binding. It's a pretty versatile pouch. 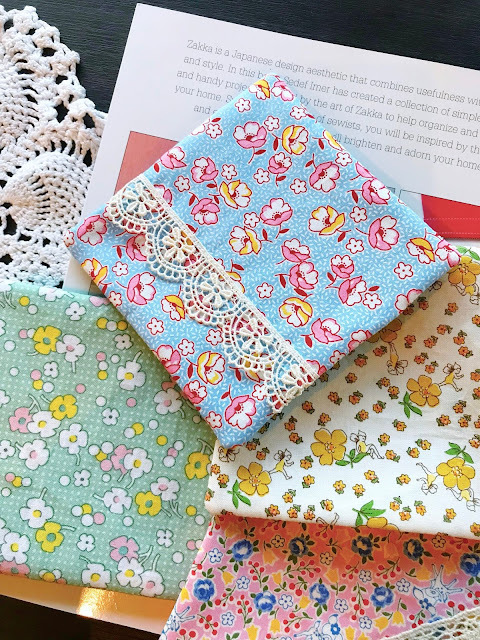 You can use long or short zippers (whatever you have in your stash) in any length or width or type. You can try to handsew too! It just takes triple the time. Step 1: Gather all materials. Zippers (of course), 2 fat eighths if you are using 6~8 zippers (lining and backing), 1 fat eighth interfacing (great to have a fusible one but it's ok too if you don't have). Step 2: Arrange the zippers as you desired. Make sure the zipper pulls are in alternate directions. Step 3: Sew the zippers together. I use a regular machine foot but it will be good if you change to zipper foot. It might boost your confidence in sewing zippers! But anyway, it doesn't really matter because we are stitching the zippers together close to the edges. 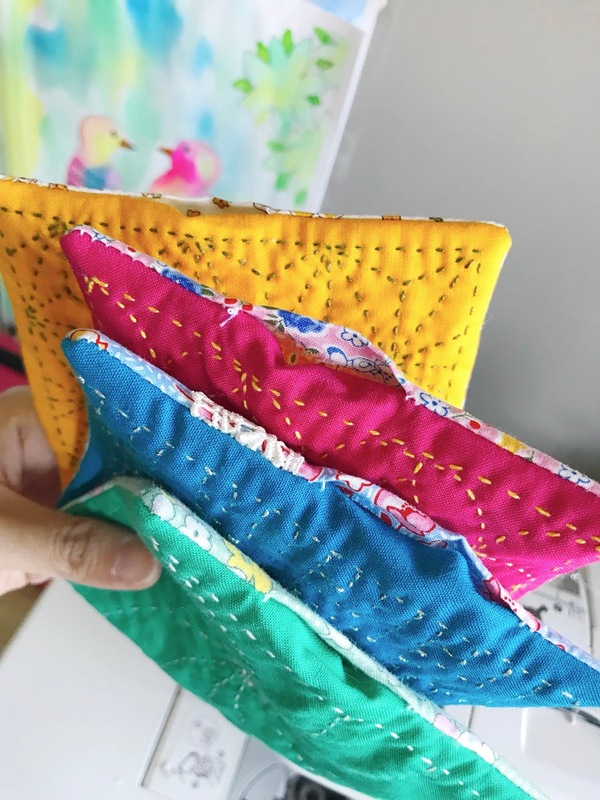 ps: you can use pins to help you during sewing. I am lazy so I just aligned them by eyeballing. 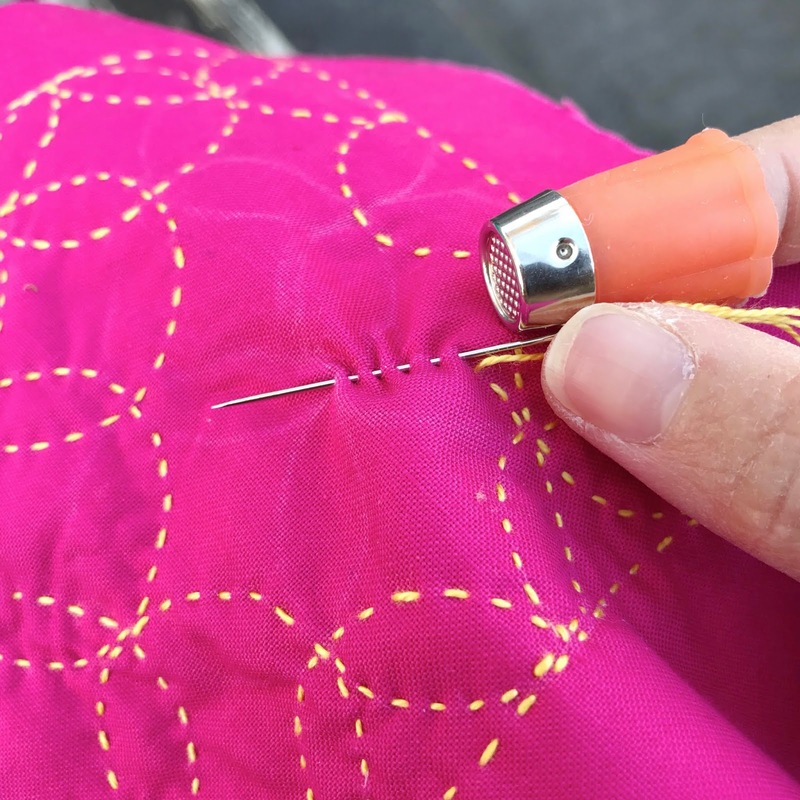 Important point: Whenever about 1 inch reaching any zipper pull, stop stitching with needle down. Lift up the presser foot and slip your fingers in to pull the zipper pull behind and away form the needle. It takes a little patience to master this skill. But once you get it, it gets really easy. Then continue sewing to the end of the zippers. Repeat for the rest of the remaining zippers. Step 4: Place backing fabric (wrong side up) then interfacing then lining fabric (right side up). *If you are using fusible interfacing, you may fuse it to the lining fabric first. * Machine or hand quilt them together. Step 5: Assemble the zippers part (wrong side up) and lining/backing part (lining side up). Pin and sew a quarter inch all around the four sides. Make sure you leave one zipper unzipped for turning the pouch inside out. Trim and edges. Step 6: Sew bias binding to cover up all the raw edges. I used ready made one. The pictures above show step by step on how I added the bias binding. Machine sew on the zipper side then finish off with hand sewing on the fabric side. I like to snip a little off the four corners so I will not get sharp corners. The last part of sewing the short ends of pouch. And you have a super zipper pouch all ready to go! All you take is less than one to two hours. It's so easy and satisfying seriously! Taking more than half a year break from sewing and social media was something I needed for the longest time. For the past months, I spent most of my time cooking, reading, learning new skills and being just there for my family and children. We travelled a fair bit and caught up with the joy of being together every single hour. It was a wonderful period of living the moment. 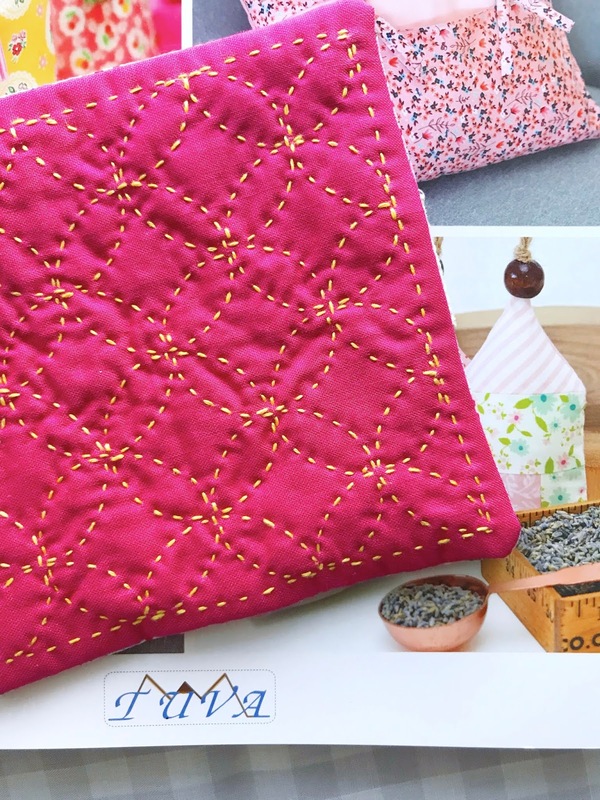 When Sedef sent me a mail for this book tour, I felt so ready to take the plunge and handsew again. It was the perfect timing to pick up my needles and enjoy the pleasure of every stitch and knot. 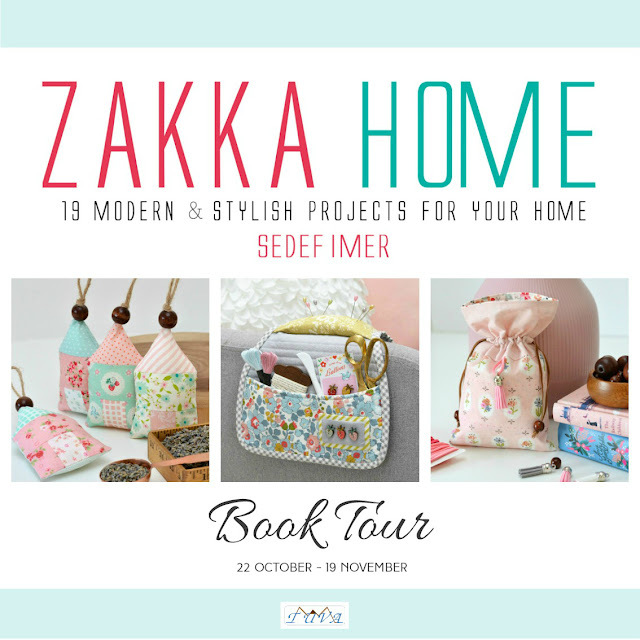 Zakka Home seems like it's written just for me. Every project is so beautiful and very zakka. The projects are useful and pretty. I love everything in the book and it was so hard to choose one to showcase. Sedef always make eye candy sewing stuff. Because we were leaving for a quick trip to China, I finally decided to choose to make "Sashiko coasters" so I could bring the project along with me. It was the best choice ever. 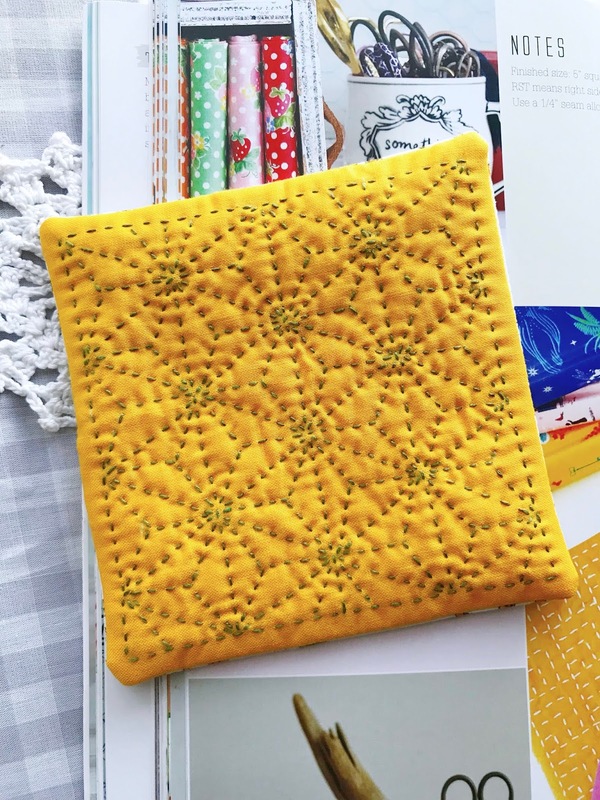 I have started sashiko sewing more than ten years back so it was like meeting an old friend again. There are several rules for sashiko sewing but this time, I only followed one rule: no two stitches should touch. The rest of the stitching, I followed my heart. Never did I know I would fall in love with hand sewing again with this project. So I am thankful. 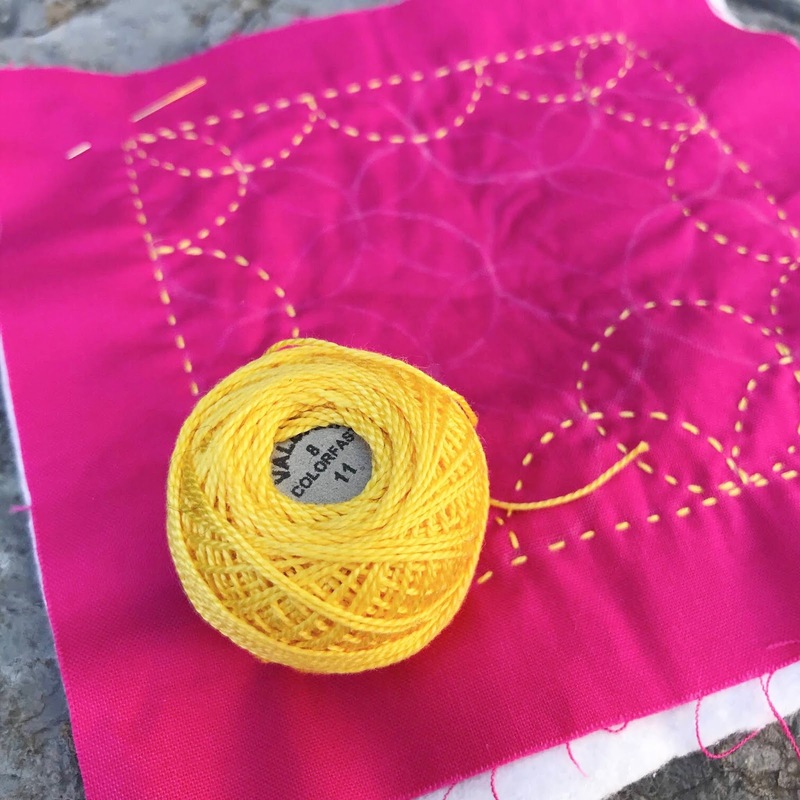 I sew each stitch with peace and calmness in my heart and mind. I got to handsew under the autumn trees which was truly amazing. Instead of using the real sashiko thread, I tried valdini thread and Lecien silver thread. Both look really fantastic with the monotone coloured fabrics (Robert Kaufman). Before stitching close the openings after flipping over. 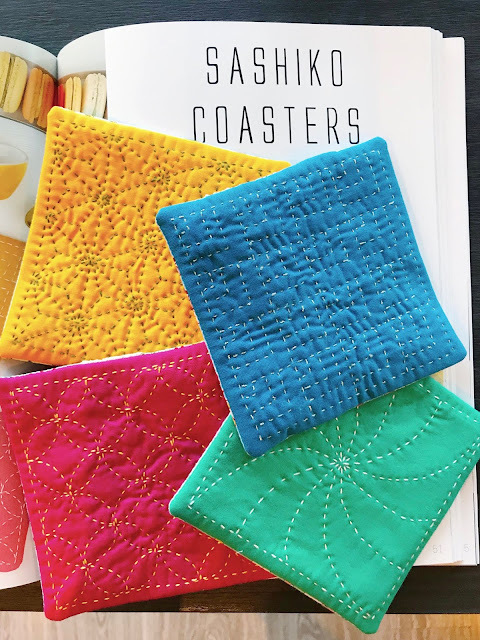 I added lace on the reverse sides so the coasters can be used either way. This book is perfect for beginners and intermediates with clear simple straight-forard instructions. 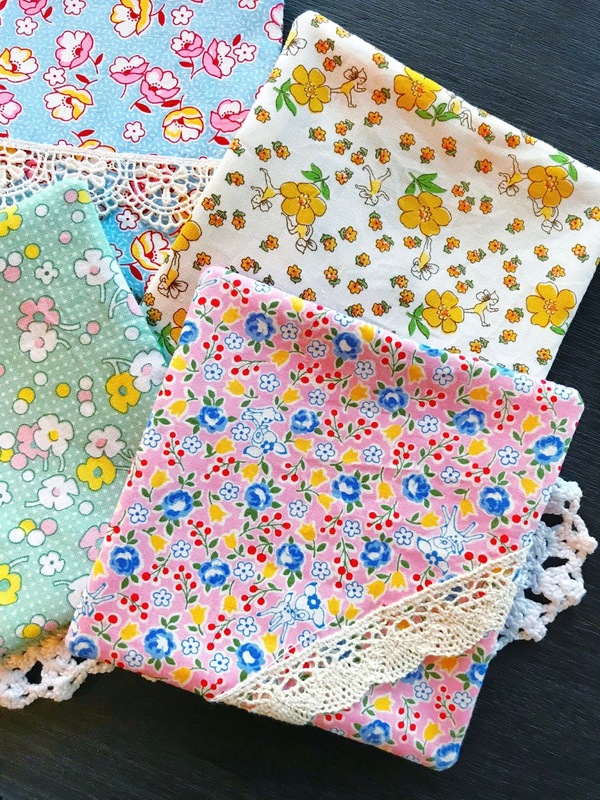 It is also great for advanced sewists who is looking for fast easy projects for your home or loved ones. 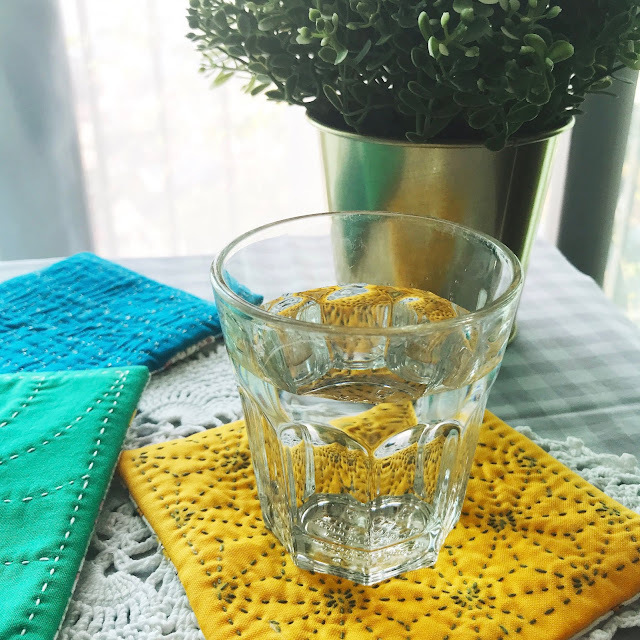 I am so grateful to handsew these sashiko coasters. Hello I am Wynn. 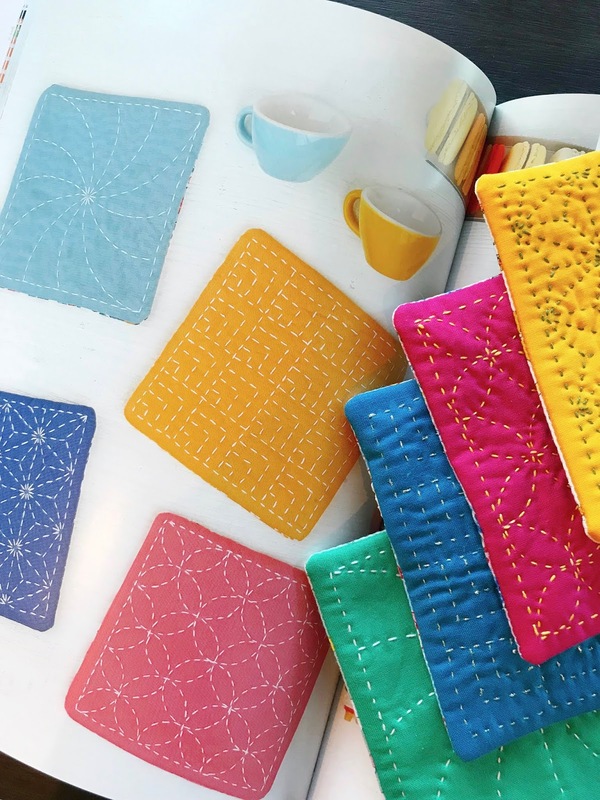 I love handsewing, patchwork, baking, cooking, coffee, crocheting, reading and everything beautiful. Wife and mama living in Singapore. 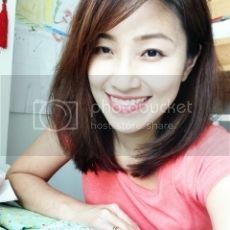 Copyright reserved by zakkaArt.. Powered by Blogger.